It all started with The Godfather. They made Part III years after the first two movies. Then they made the sixth Rocky flick. Then the fourth Die Hard film. And then they made the fourth Rambo film. It seems that when Hollywood decides to continue a successful franchise, it almost always doesn't agree with the critics. The only exception seems to be the Star Wars prequels, but that's because they are real legitimate prequels. The others are, well, money-making ventures. And this film is no different. Don't get me wrong, I am a fan of Spielberg, not because of the types of movies he makes, but because of his storytelling style. He is one of the few filmmakers I know who can tell a story really well just by the pictures alone. But sadly, his storytelling powers go to waste in this movie, as it practically offers us nothing new about the exciting archaeologist, who is actually the prototype for the Tomb Raider Lara Croft. There is no shortage of action, as the film begins with a warehouse shootout in─where else─Area 51. That's already a foreshadowing tool, telling us that there will probably be an extra-terrestrial being later on in the film (and there will be). There is also a motorcycle chase with Indy and Shia LaBeouf, inside the university campus. Only in Hollywood will you see a motorcycle crash into a library. Acting-wise, Harrison Ford seemed like he just went for a nineteen-year vacation, as his Henry Jones, Jr. character never changes from the last time we see him in The Last Crusade. Karen Allen reappears as Marion Ravenwood, who we last saw in Raiders of the Lost Ark, and her on-screen chemistry with Ford is the same as it was back in 1981. Cate Blanchett is, as usual, ravishingly beautiful, especially with that Russian accent, and her hair looks pretty good on her. John Hurt is amusing as the crazed out Professor Oxley. But the two best performances come from Shia LaBeouf, the greaser boy who is actually Henry Jones III, and Ray Winstone as the double-crossing Mac. LaBeouf has proven that there is more to him than a klutzy heartthrob, and there will definitely be more roles coming up for this actor. Ray Winstone, meanwhile, shows his brilliance once again, and since Spielberg loved his performance in Beowulf, Winstone might just appear again in the upcoming Tintin flicks. Let's just keep our fingers crossed. 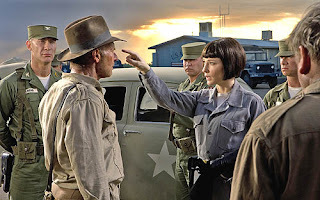 Meanwhile, watch this film if you are a fan of Dr. Jones, or watch it if you are a fan of action and adventure movies. Do not watch it if you want to be blown away, because you most probably won't. You might also want to check out the review of Raiders of the Lost Ark.